JR is the pseudonym of a French photographer and artist whose identity is unconfirmed. Describing himself as a photograffeur, he flypostslarge black-and-white photographic images in public locations, in a manner similar to the appropriation of the built environment by the graffiti artist. 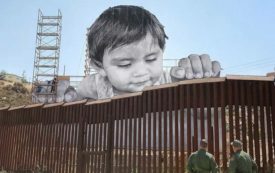 Street Artist JR Installs Massive Face of a Child on Mexican Side..